The filtration expert delivered better-than-expected profits, and management said it expects to deliver on its full-year sales and earnings guidance. The company reported net earnings of $58 million in the quarter, good for $0.43 per share. That's a 51% increase from the $38.5 million ($0.29 per share) the company reported in last year's first quarter. 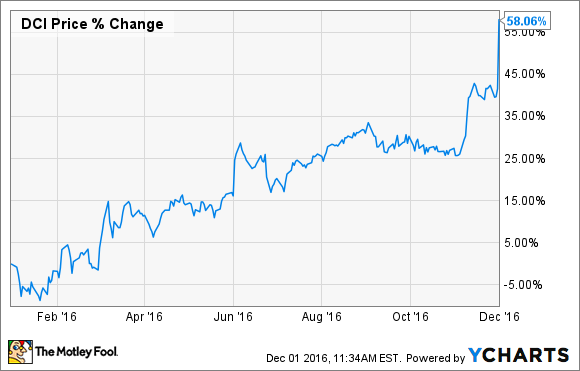 Adjusted for one-time gains, earnings per share were $0.38 in the quarter, 12% better than last year's $0.34 per share adjusted EPS. In the earnings release, CEO Tod Carpenter said the quarter's results put the company "on track to achieve the full-year sales and adjusted profit targets that we laid out last quarter." Donaldson's higher profits came on relatively flat sales, with the quarter's revenue of $553 million only 2.8% higher than one year ago. However, gross profit was up 9% thanks to increased manufacturing efficiencies that helped drive down costs. The company also reduced operating expenses by $4.8 million, or 3.9%, which, combined with the small revenue increase and lower cost of sales, boosted operating income 38% to almost $80 million. Even with strong profit growth, management continues to be cautious about the outlook, with guidance for full-year revenue between a 2% decrease and a 2% increase from fiscal 2016 as global economic growth remains weak. Considering about 60% of Donaldson's sales come from outside North America, investors should be aware that there are many factors that could affect the company's ability to grow sales and profits in the near term. As things stand today, Donaldson is on the expensive side, trading at a forward price to earnings multiple of between 27 and 30, based on the company's own guidance. While the market is clearly happy with this quarter's results, it looks like it's probably ahead of itself, particularly with muted growth prospects in the near term. Donaldson is a solid company and a leader in its space, but its customers continue to deal with macroeconomic and cyclical weakness. And that limits Donaldson's prospects for now.